I protest against ISRO Chairman K Radhakrishnan and Directer of Vikram Sarabhai Space Center, S Veeraraghavan for their actions against the constitutional duty of Article 51Ah according to which, every Indian citizen is expected to promote scientific temper. It is a petty matter when an ailing patient or a failing student prays god. However, it is a grave national disgrace when persons of elite stature such as yours stoop to the level of commoners to pray at Saibaba Temple or Lord Venkateswara Temple for professional success. I wonder if you spent for the travel and worship expenses from your own pockets. I also wonder if your absence from duty for a purpose that is against your fundamental duty should be considered as 'a break in service' and those leaves of absence should be considered as 'un-paid leaves' and all consequent dues should be recovered from you. It is also disgrace to the global community of engineers and scientists on whose behalf you (S Veeraraghavan) have audaciously claimed that "We scientists and engineers do our best and leave rest to the God". Scientific temper is a greater, more important and independent skill than tech savviness or science literacy. God has no place in science. It is part of your professional responsibility to guide India out of the superstitions, gullibility and faiths that have riddled our country, especially with greater penetration after 1990. In these actions, you have caused more damage to India than the monetary benefits from the success of PSLV-C21, by setting a wrong example to follow for people, regarding desired attitude towards faith. I wish that you repent your actions and strive to undo the damage done by you to the public psyche. By the way, as an aside, have you ever considered blaming your gods (and claiming damage recovery from the temple trust authorities) when some of the earlier Indian rockets failed? Ahead of India's landmark 100th space mission, ISRO Chairman K Radhakrishanan today offered worship at the hill shrine of Lord Venkateswara near here praying for its successful launch. Radhakrishanan is a frequent visitor to the over 2000-year-old shrine before every mission, temple sources said. 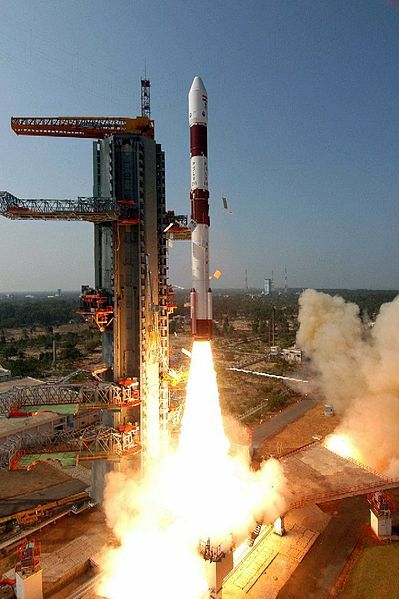 The mission, in which a 720-kg SPOT-6 remote sensing satellite from France (built by ASTRIUM SAS) and a 15-kg Japanese spacecraft PROITERES would be placed in orbit by ISRO's PSLV-C21 on Sunday from Sriharikota, will be witnessed by Prime Minister Manmohan Singh. A replica of PSLV-C21 carried in a bag by the ISRO Chief was placed at the feet of the presiding deity for a while by temple priests, the sources said. Why is it that you guys don't take up more serious issues like Muslim fundamentalists' violent protests over a film? Why are you so agitated over a scientist's personal idiosyncrasies? I too am an atheist. But I have nothing against people (including scientists) who have theistic inclinations as long as they don't create problems for others as the fundamentalists of various religions do. In what way does ISRO chairman's personal beliefs harm scientific progress in India? I totally support Carvak's view point. This act has really put us back to old age. I m a regular reader of this website and this is what we need than blindly following beliefs. I believe everyone has different view point on this, and sadly I have met people who think that there's no problem in what ISRO chairman has done. But praying to God, having a belief and following superstition are way to different. I do not belive in God but I respect people's belief. But being a scientist its his job to trust in science do his job rather than doing rounds to temples. I think next thing he will do is put the miniature rocket model in water untill the real ones flies successfuly. At this time of problems we need rational minds and not like these. Seriously this is most damaging than anything else. Belief in science is something a commoner does not know in India. Scientific attitude, rationality, is what should be sown in everyone's mind from the very start. but here we follow traditional biases, beliefs which have no backing except they are being followed endlessly. If we look at our scientists to preach upon science but they themselves rely foolishly to godly prayers then whom should we too look upon? this may be visible as small incident but then clearly depicts that how old believers we are still. "I totally support Carvaka's viewpoint". Well, though we entirely agree with the contents of the letter, it was not we who wrote the letter to the ISRO Chairman. The credit goes to Nikhil Joshi, whose letter we merely uploaded on our website. The ISRO Chairman did not visit the shrine as a public stunt like politicians do to impress religious people. The scientists seems to have deep faith in god. The question is: If a scientist/technocrat believes in god and he wants to pray and express his gratitude to the god for whatever he achieved and seek blessing from him for future ventures, how will he express it? To non-believers, this may look funny. But try to take a look from the other side. How should he express it in a secular society? It is a valid question. But in a state that is officially declared as 'secular', all politicians, bureaucrats, and other functionaries of the government should not indulge in open display of their religiosity in their capacity as public servants. In this case, the ISRO chairman is a scientist heading a research body funded by government. He has no business to carry the replica of PSLV to a shrine. This would not have been an issue, were it done by an ordinary individual who is not an official associated with the research body. The people (mostly Hindus) who find nothing wrong in the ISRO chairman’s propensity to visit Hindu shrines in his capacity as an ISRO official, should ask themselves what they would have thought had the chairman been a Muslim or Christian and he had carried the replica to Darga or Church. Coming to an earlier comment made by “spiritualnastick” to the affect that the rationalist should focus on “more serious” issues involving Muslim fundamentalists…. Yes, the violence perpetrated by fundamentalists of any hue should be condemned unequivocally. In a secular society, the concept of blasphemy should not find any place, however outrageous the criticism of religions are – whether it is through writings, films, cartoons, etc. Rationalists should take up these issues and they are taking them up. But one should not then come to the conclusion other “less serious” issues like developing scientific outlook should be ignored. That will be suicidal for a rationalist and secularist. The very foundation of a robust secular society is its scientifically minded citizens. Hence when a government functionary (and that too a scientist) indulge in a behavior antithetical to a rational/secular society, it is the bounden duty of every rationalist to criticize such officials. "Several scientists, Amitabh Pandey, have slammed Radhakrishanan, saying the ISRO Chairman's act is against scientific belief." It'll be nice if we could express our support to Dr Pandey. "After the 12th commercial launch of Polar Satellite Launch Vehicle termed PSLV-C12 from the spaceport here, ISRO has jumped one number and called its next rocket, that launched Oceansat-2 and six European nano satellites, as PSVL-C14." In case of Muslim protests, no Muslim scientists have expressed their support for the riots. In that case, the problem is because of politicians and many of them are anti-reason. Even Obama carried Hanuman in his pocket (which technically he should not because it is against his Christian faith). No better can be expected from populist gullibles like APJ Abdul Kalam, Rajiv Gandhi, Pratibha Patil, Atal Bihari Vajpeyi or even Indira Gandhi (especially during her later life). spiritualnastik has asked a question: How may a faithful scientist express own prayers and gratitudes in a secular society? Well, notwithstanding the fact that the phrase 'faithful scientist' is oxymoron, I'll reverse the question: How may any person (in this case a skeptic) express own disgust when the person finds another person (especially at a responsible position) acting ridiculously? I don't think it is as simple as Mr Joshi puts it. Though it may seem oxymoron to us atheist, it is not necessarily so for many people who do not find any incompatibility between science and belief in god. I can list any number of scientists who believe in god. That apart, we have a very interesting case of one of the foremost skeptic who was the torchbearer of modern skeptical movement in the western world asserting his faith in god. I am talking about none other than Martin Gardner, who was the founding member of CSICOP (recently renamed CSI) and who wrote such classic skeptic books as Fads and Fallacies in the Name of Science. Gardner called himself a fideist. Perhaps, I should recommend his book The Whys of a Philosophical Scrivener which puts forward his philosophical views very cogently. Though I, an atheist, do not subscribe to his views on belief in god, the book helped me to understand people who find it easy to reconcile science and their belief in god. There are more number of scientists who find it wrong to believe in god. And anyway it is not a matter for democratic vote. Truth remains truth even when noone supports it. Martin Gardner was not a scientist, his most important role was as an entertainer. He said, "Philosophical theism is entirely emotional. As Kant said, he destroyed pure reason to make room for faith". So he too seems to agree that science and faith can not co-exist. Therefore, a person who is paid from tax-payer's money to work for science should ensure that his actions don't endorse faith. Else it would be like an off-duty cop buying illegal booze. In fact, in this case the officers might even have spent for travel from Govt money and if so, apart from being anti-science that would also be anti-secular. The best option for men between 18-35 would have been a leather-based cuff take pleasure in. This certain type utilizes this highly popular natural buckskin cuff arm group, as properly as assimilates a wrist watch Replica Chopard watches inside the design and also style. This provides replica audemars piguet jules audemars watches it a really fashionable seem, without like you try way too hard .. This could be the perfect accent for donning daily, when you head out out. Preserve your replica Bell & Ross br 01 tourbillon watches gold and silver coins timepieces at any time a person liven up, and employ your overall natural buckskin cuff watch in any way maybe. Investing in a leather cuff observe can be a straightforward approach ﻿replica Hublot watches to give the clothing assortment the start working the distinct pants. Don't become surprised when you've got good seeking girls replica designer handbags coming your responsibility together together with enhancing your system on its brand-new watch. Is ‘Hindu’ our National Identity?